Wild Acres Old Orchard Beach Maine – Crazy Camping! Wild Acres, located along the Southern Maine Coast in Old Orchard Beach has a slogan – that you see throughout the campground – “75 Acres of Camping Serenity”. Now, I don’t know how people from Maine define “serenity,” but Wild Acres lives up to it’s name. WILD. Wild Acres is one of the largest campgrounds we have visited. Sun & Fun in Sarasota Florida is BIG. Fort Stevens, Oregon is also BIG; Cachuma Lake in Santa Barbara as well. But this was probably the largest campground we have visited. Over 600 sites – and a mix of site types. Lots of Activities for the Kids….. When we arrived, I was overwhelmed by the number of sites, people, kids. Many of these campers have been coming here for YEARS. 20, 30, 40 years. So what did they love – and keep returning to – that I was missing? 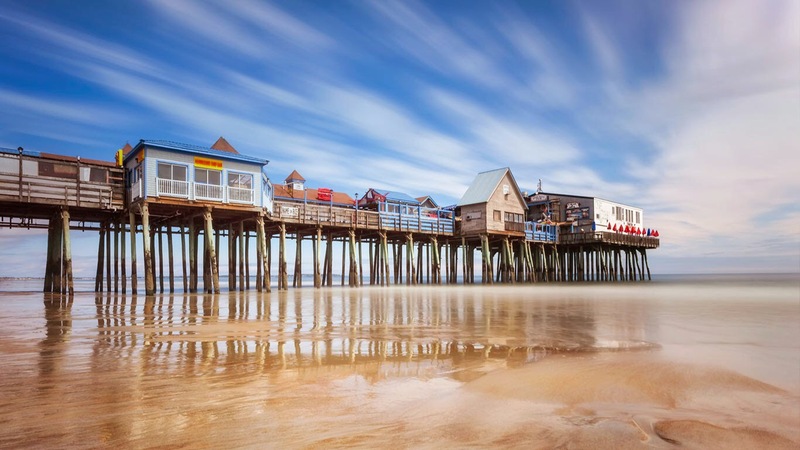 After all, OOB was named one of the coolest small towns in the US by CNN. It took a few days to figure out, but we finally worked through it. First, A close walk to the beach. Second: Good Kayaking minutes away. with good company! 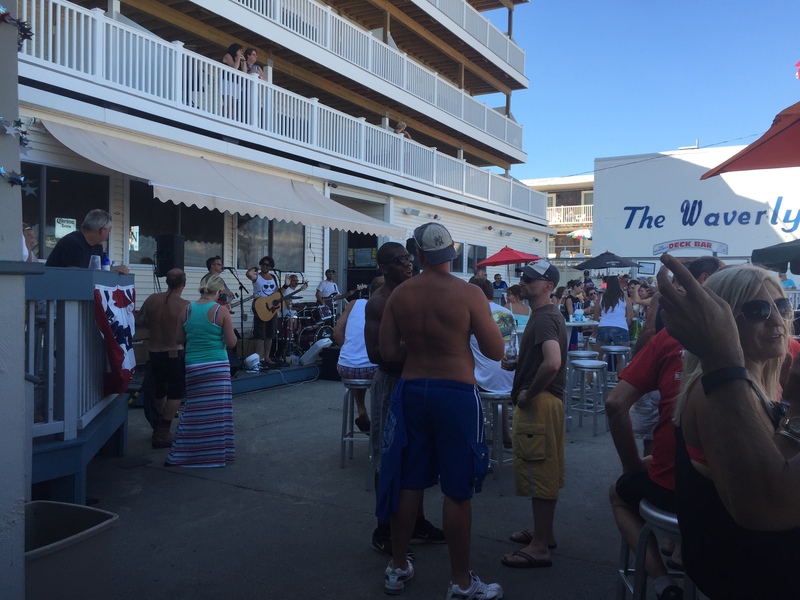 A great beach bar – the Brunswick – known to locals and long-timers as the “Swick.” Live music, no cover, cold beers and great people watching! 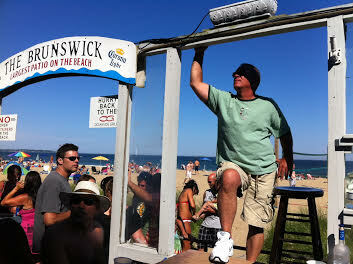 Our new favorite beach bar (sorry, Jimmy B’s). And finally amazing lobster! we were lucky to share a great lobster dinner with Linda, David, Mark, Lisa and Linda & Lisa’s Mom who has been visiting OOB for over 30 years! and finally that same night we hung with the Wild Acres Doyenne, Sandy. Miss Sandy checked us in and has been working on site for over forty years. She runs the show – nobody messes with Sandy! 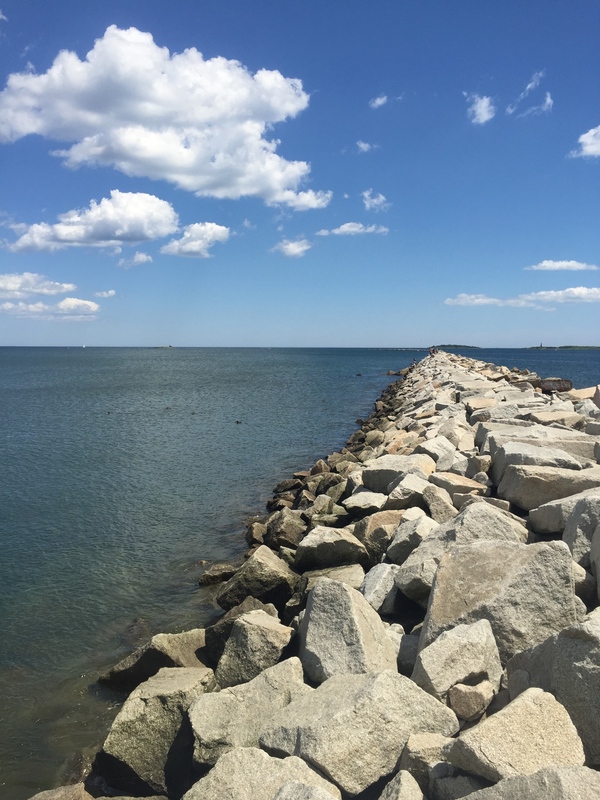 A Visit to Beautiful Bar Harbor Maine – our trip North Continues…. Wow! that looks like such fun. Hey Norah – how are you and where are you spending your summer? It was fun! And CNN did name it a top ten cool town……. A funky beach town and lobster! Sounds great! That last picture is a stunner! OOB sounds like fun – may have to look into that for when we leave Bar Harbor. Can’t wait to hear about your time in Canada! Thanks guys! Miss tou both hope you are doing well.